From the opening lines of A Promise Kept, I knew I could relate to Alison Kavanagh’s story of life not turning out the way she expected but having to learn to embrace it for what it is now. She is a newly divorced woman starting over in the mountain cabin that once belong to her great aunt Emma. Although the circumstances of each of our lives may differ from Alison’s, it is one that most readers can relate. The pain and disappointment of unfulfilled hopes and how our faith often takes a nose dive when we enter these seasons of disillusionments is weaved throughout this story. What happens when God doesn’t answer your prayers in the way you expect that he would? What happens when he says let go but instead you cling on tightly? The book also contains a beautiful message of hope, grace, forgiveness and the power of prayer. Interwoven with Alison’s story is great aunt Emma’s story from the 1920s. Typically I do not enjoy books that switch between different time periods but I found myself skipping ahead to see what happened next in Emma’s journey. This was my first time reading a book by Robin Lee Hatcher and I felt that she presented realistic characters who struggled with walking out their faith. Although the book is fiction, it was interested to read the author’s note that she shared a similar history to Alison. About the author: Robin is the author of 65+ novels and novellas. Her home is in Idaho, where she spends her time writing stories of faith, courage, and love; pondering the things of God; and loving her family and friends. Don’t miss Robin Lee Hatcher‘s stunning new novel, A Promise Kept. Robin is celebrating with a fun giveaway and an encouraging Facebook Author Chat Party. Enter today by clicking one of the icons below. But hurry, the giveaway ends on February 6th. 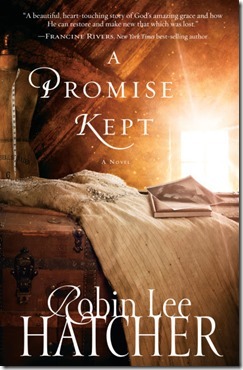 Winner will be announced at the “A Promise Kept” Facebook Author Chat Party on the 6th. Connect with Robin and friends for an evening of encouraging book chat, prizes, and an exclusive look at Robin’s next book! Don’t miss a moment of the fun; RSVP today by clicking JOIN at the event page. Spread the word—tell your friends about the giveaway and party via FACEBOOK or TWITTER. Hope to see you on 2/6! Thanks so much for hosting A Promise Kept on your blog. I’m glad that you enjoyed the book. My pleasure Robin. I look forward to reading more of your books. Sounds like a great book! I especially liked the *mountain cabin* setting! Thanks, Wanda, for always sharing good reads! Yes it’s sounds like just the place you & your husband would enjoy Sharon.